22 Cans mustn't grow, says Peter Molyneux; growth was the tragic mistake he made with Lionhead. The last cubelet's gone, and Peter Molyneux's Curiosity: What's Inside The Cube - the first of what was supposed to be 22 experiments launched by Molyneux's 22 Cans studio - is done. Now all efforts are concentrated on Godus, the god game that 22 Cans initially thought it could do in-house, but has since taken to a free-to-play publisher. That was a deliberate decision, inspired by 22 Cans' experience with Curiosity, Molyneux says. Curiosity's mobile launch was a back-breaking effort for the small studio, and the result was a buggy release that required intensive after-launch labor to keep afloat. "We just can't do that," says Molyneux, "we're not big enough to do that." Nor does Molyneux wants to expand 22 Cans, as he sees growth as the "horrible, terrible, tragic mistake" he made with his previous studio, Lionhead. "Lionhead grew to like 300 people," he says. "We just forgot who we were. We forgot why we were. We forgot what was important." Hence his deal with free-to-play publisher DeNA, but he wants to assure gamers - and backers of his Godus Kickstarter - that DeNA will have no influence on Godus' design. Everyone who Kicked in for a mobile digital copy will still get what they pledged for. But much of the end result - at least in terms of microtransactions and pricing - is up in the air at the moment, as Molyneux wants to get input from the pledgers before making any decisions. However there is one decision that Molyneux has already made, and that has to do with the 22 experiments that 22 Cans was meant to be working on. "I'd love to have the time to do that," says he, but adds that "I don't think that would be sensible to do at the moment." Everyone at 22 Cans is working at full capacity, and he doesn't want to crush them with more workload. Some of the experiments - not all, but some - have had to be sacrificed on the Godus altar. That said, Molyneux plans to sneak some of his experiments into the Godus alpha, and there's always time - once Godus is released - for a return to that experimental vision. In fact, the results of those experiments could be plugged into Godus, over time. "You've always got to remember that in today's world," says Molyneux, "you can continue to develop a game for many, many years after the release, if people like it." 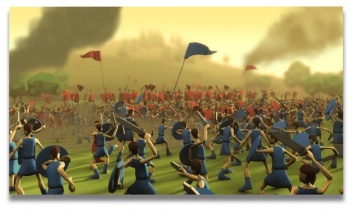 Godus' release date has yet to be confirmed. It will be a PC and mobile title, when it launches.